Very little is known about Lance-Corporal James Welch prior to his actions during WWI. However, we do know some basic details. According to Welch’s grave in Bournemouth crematorium, he was born in 1889 on July 7th in the small English village of Stratfield Saye. Welch must have had a fairly boring childhood because literally the next thing recorded about his life was that he joined the Royal Berkshire Regiment. After signing up, Welch was drafted to the first battalion of the RBR where he quickly attained the rank of Lance-Corporal. Once again, the records of Welch’s activities disappear into obscurity. That is, until he won a Victoria Cross on April 29, 1917 in France. More specifically in the French commune of Oppy, which we wanted to mention separately because we like that word. 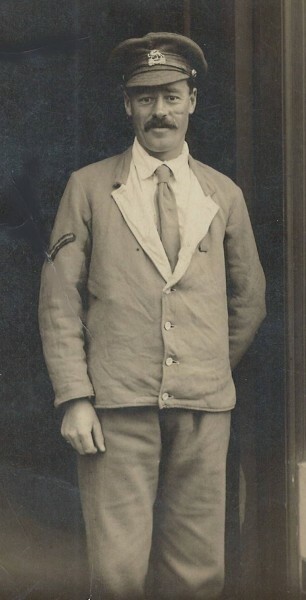 According to Welch’s Victoria Cross citation, he and his unit were advancing on a strong German defensive line in Oppy during the Battle of Arras, when, for reasons that aren’t documented, Welch broke off from his unit and leapt into a nearby German trench where he came face to face with an astonished German soldier. Unfortunately Welch only had an unloaded service revolver on hand when he leapt into the trench, which was bad news… for the German soldier Welch brutally dispatched using nothing but his bare hands and terrifying man-strength. But Welch wasn’t done being an unthinkable badass quite yet, because hiding in the same trench were four other, fully armed German soldiers just itching to avenge their fallen comrade. Back to WWI, Welch, rather than counting his blessings as the Germans fled, tore after the men, again, armed with nothing but an empty revolver. They could have turned around at any point and shot him in the face, but, of course, they didn’t know his gun wasn’t loaded, so fled from the moustachioed menace that was, Lance-Corporal James Welch, before they were eventually captured by him. Unfortunately, Welch’s Victoria Cross citation doesn’t actually mention how exactly he managed to complete the capture of the four soldiers without incident, just that after the chase, they surrendered to him. After capturing the soldiers, Welch spent the next 5 hours defending his position with a machine gun. The citation doesn’t make clear where Welch managed to procure this machine gun from. One would think he perhaps stole it from one of his German captives. However, according to the book, Oppy Wood, which details the battle Welch took part in, Welch was the soldier in charge of manning a Lewis gun, which was popular with the British military during WWI. Wherever he got it, Welch managed to put it to amazingly good use, not only defended himself against an enemy force with little more than a machine gun for 5 straight hours, but on more than one occasion during the fire fight, he ran into open ground while under fire to scavenge for equipment. After sustaining his injury and later receiving his Victoria Cross, Welch managed to attain the rank of Sergeant before the war came to an end. As for what happened to Welch after the end of the first world war, Gerald Gliddon, the author of a series of books on recipients of the Victoria Cross, reports that Welch worked in a box factory in Sheffield until around 1960. Only taking a break for WWII, during which he joined the Royal Air Force Auxiliary Reserve. After 1960, Welch then retired to Bournemouth with his wife, Daisy, whom he’d married in 1915. Welch passed away at the tender age of 88, presumably after losing a fist fight with the Grim Reaper, the latter of which we can only assume must have cheated somehow. I had no idea Germany had soldiers with four arms. Today I found out about it.